Protein assists in rebuilding the muscles you break down during your workouts.Our recovery shakes are packed with protein, carbohydrates, vitamins and provide a long slow release of energy to keep you going during those long afternoon meetings or after the gym. It fills you up at mealtime, so you’re not reaching for unhealthy snacks or that quick slice of pizza.. It’s essential for weight control, athletic performance and overall good health. Protein does the heavy lifting on helping you get the most out of your muscles. You’re chasing kids. Lifting bags of groceries. Getting in a workout. It all takes muscle. And those muscles need protein to perform, as well as repair after all that activity. Protein helps you maintain toning, so you can keep moving – and also look good doing it. Get more energy from the right combo of protein, carbs and fats. Simple carbohydrates are famous for giving you quick energy, but also for the subsequent crash. The right mix of protein, carbs and fats can give your body a longer-lasting source of energy. You see, each of these macronutrients takes a different amount of time for your body to break down. First you’ll absorb the carbs, then the protein, then the fat. Our recovery shakes have a low glycemic index so you’ll have more energy over a longer period of time. Shakes That Taste Great And Fight Hunger. Nothing satisfies like protein. Our shake bar was designed by a chef with a nutrition background. Not only are our shakes healthy and packed with natural ingredients they taste great. Want fewer cravings? Protein takes longer to digest, so it naturally makes you full longer. That is great news if you’re watching your weight or prone to grabbing unhealthy snacks. As we age, we lose muscle mass and strength. But don’t despair! Recent findings show this muscle loss isn’t inevitable. Eating a sufficient amount of healthy protein and carbohydrates will help slow the loss of muscle mass.To benefit from the anti-aging effects of protein many experts are recommending to consume 25-30 grams per meal. Combine that with resistance training and you’ll be well on your way to maintaining a strong and vital body for the rest of your life. Immediately following a workout is when your muscles need to fuel up. You need to recover, restore, and replete. There a lot of protein smoothie bars out there. 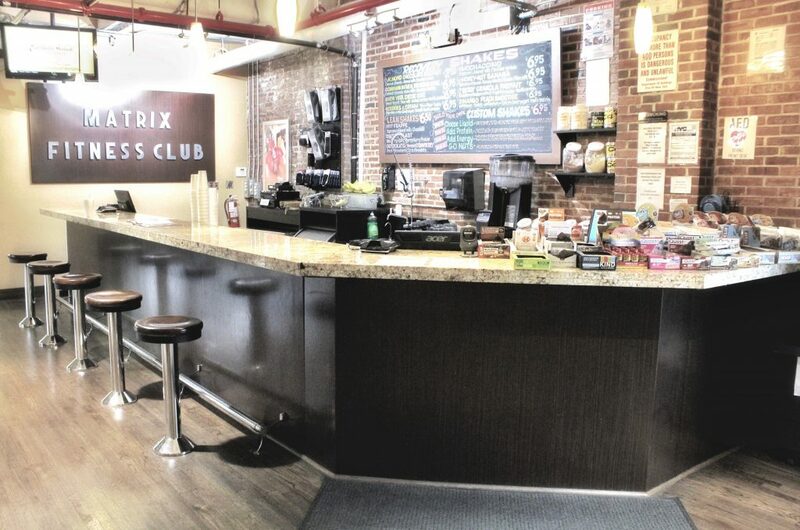 Matrix Fitness Club’s Smoothie Bar, is here to provide you with the best natural ingredients, made fresh in front of you. You can choose one of our 20 recipes or ask to create your own custom made smoothie in minutes! Want to experience the benefits of a Matrix recovery shake try one and see for yourself.